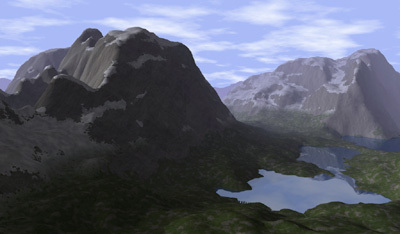 Arround 2002 I made my first attempts to visualize fractal mountains and test procedural texturing. At that time I was not able to raytrace polygons and my rasterization engine was really bad. So I chose to do a "raymarcher" to create some pictures cause it's a really simple technique. What I implemented was a quite brute force thing and was very slow. But it was very simple to code, something I could afford, and allowed me to do some nice images, with reflections and some participating media too. That's in fact the beauty of the technique - an incredibly simple code that produces interesting images. It's perfect for small size demos, that's why it has been used so much (think in Hymalaya/TBC or Ixaleno/rgba - the image below this text, which is created from a 4 kilobytes executable). In fact you can code a basic prototype in few minutes (Ixaleno was pretty much done in one day, coded from scratch during 2007 Christmas; then of course I had to spend some extra days tunning the colors etc, but that's another story. 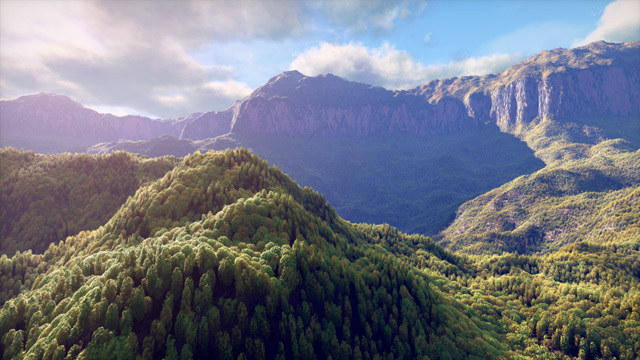 The purpose of this article is not to generate interesting terrains or landscapes (see articles like the one on advanced value noise), but how to render those with the simple raymarching algorithm. The basic idea is to have a height function y = f(x,z) that defines for each 2d point in the plane (x,z) the height of the terain at that point. 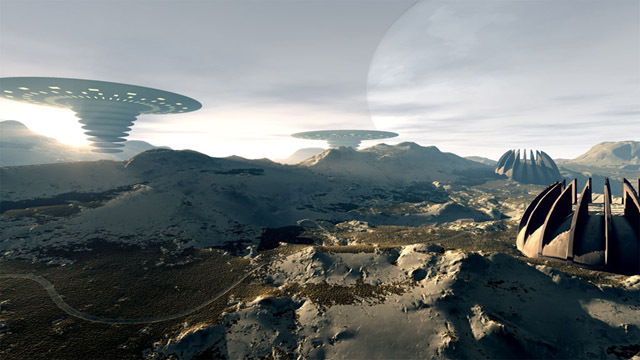 Once you have such a function f(x,z), the goal is to use a raytracing setup to render the image and do other effects as shadows or reflections. That means that for a given ray with some starting point in space (like the camera position) and a direction (like the view direction) we want to compute the intersection of the ray and the terrain f. The simplest approach is to slowly advance in the ray direction in small steps, and at each stepping point determine if we are above of below the terrain level. The image below shows the process. We start at some point in the ray close to the camera (the leftmost blue point in the image). We evaluate the terrain function f at the current x and z coordinates to get the altitude of the terrain h:h = f(x,z). 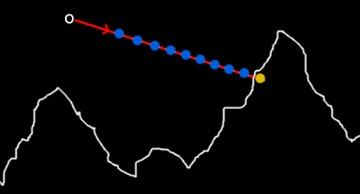 Now we compare the altitude of the blue sampling point y with h, and we realize that y > h, or in other words, that the blue point is above the mountains. So, we step to the next blue point in the ray, and we repeat the process. At some point, perhapse, one of the sampling point will fall below the terrain, like the yellow point in the image. When that happens, y < h, and we know our ray crossed the terrain surface. We can just stop here and mark the current yellow point as the intersection point (even if we know it's slightly further than the real intersection point), or perhaps take the last blue point as interesection point (slightly closer than the real intersection) or the average of the last blue and yellow points. The mint, maxt and dt constants should be adapted for every scene. 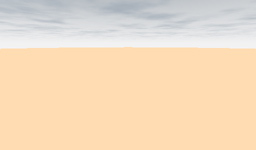 The first one is the distance to the near clipping plane, you can set it to zero. The second one is the maximun distance the ray is allowed to travel, ie, the visibility distance. The third one is the step size, and it directly influences the rendering speed and the quality of the image. The bigger it is, the faster of course, but the lower the terrain sampling quality will be. As you can see the code is terribly simple. There are many optimizations and improvements possible of course. For example, the accuracy of the intersection can be done more accurately by doing a linear approximation of the terrain altitudes between the blue and yellow points and compute the analytical intersection between the ray and the idealized terrain. The other optimization is to note that as the marching moves the potential intersection point further and further (the bigger t becomes), the less important the error becomes, as geometric details get smaller in screen space as they get further from the camera. In fact, details decay inverse-linearly with the distance, so we can make our error or accuracy dt linear to the distance. This saves lot of rendering time and gives more uniform artifactas than the naive approach. This trick is described in several places, for example in the "Texturing And Modeling - A Procedural Approach" book. The getShading() function will probably need to compute some diffuse lighting from a powerfull yellowish directional light that simulates the sun, and a dimmer bluish area light simulating the sky dome (some sort of ambient occlusion). Doing shadows in a terrain is interesting since many optimizations can be done. 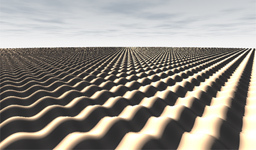 One such trick is to compute soft shadows for free by computing how depth the shadow ray went into the terrain. 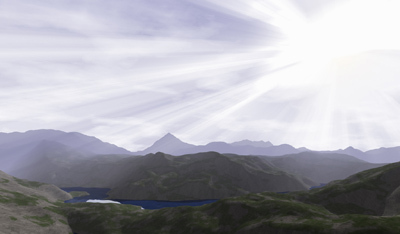 By smoothstep()-ing this amount one can control the penumbra of the mountains. To get the material of the surface, usually the altitude and slope of the mountains and the point p is taken into account. For example, at high altitudes you can return a white color and at low altitudes some brown or grayish. The transition can be controled again with some smoothstep() functions. Just remember to randomize (with perlin noise) all the parameters so the transitions are not constant and so it all looks more natural. It's a good idea to take the slope of the terrain into account also, since snow and grass usually only stay on flat surfaces. So, if the normal is very horizontal (ie, n.y is small) it's a good idea to blend with some grey or brown color, to remove snow or grass. 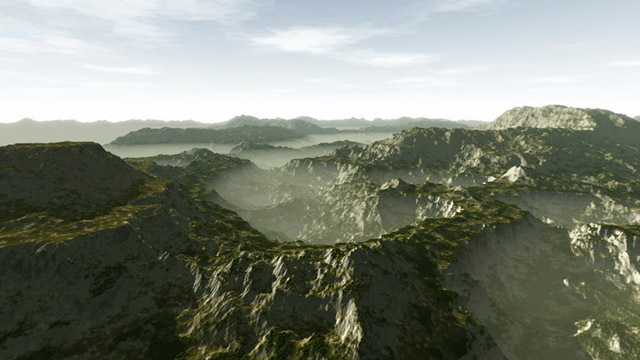 That makes the textures naturally fit the terrain, and the image gets richer.